Welcome to my preliminary teaching and performing schedule for 2016-2017. All programs are inclusive and are adaptable. This year, as lead youth/teen yoga and mindfulness instructor at Open Spirit Center, Framingham and their Nourishing Teachers, Strengthening Classrooms project, I am aiming to bring yoga and mindfulness to target populations of students and faculty at Framingham High School and Hoops and Homework, an award winning After School and Summer Program serving the most under privileged kids in Framingham, MA. *** My ability to reach these populations is determined by grants and private donations though the Open Spirit/ Nourishing Teachers, Strengthening Classrooms Project. For more information, please visit our donation page. I will be at Mini Miracles Childcare Center with Eve’s Awesome Yoga for ages 15 months-6 Years. Classes here are only available for center enrollees. Anthony Tiriti Tran and I continue our educational program, ¡Olé Flamenco! with both Young Audiences of Massachusetts and Celebrity Series: Arts For All! We can come to your school or community gathering! All programs are inclusive and adaptable. On the performance front, I will be dancing for the Boston Arts Consort and Song Caravan. On the stage, you will find me either dancing traditional flamenco or my beautiful creative gypsy-freestyle, which blends my life of dance into my own artistic expression. I am available for *private and semi private work, site specific choreography, educational presentations and master classes. *My private lesson slots are filling fast. This summer, I had the awesome opportunity to bring yoga to a BINA Farm/Warrior Thunder Foundation event and I hope to do more work with both organizations. Just throwing this out there: I am looking to create a 11+ yoga boys class. If you are interested or know of anyone, please share my information with them. Please contact me for more information. All programs can be tailored to fit your needs. Thank you and Remember to Always Be Dancing! Categories: Adamant Eve, Always Be Dancing, Always Be Dancing Mindful Movement | Tags: Accessible, ADHD, Always Be Dancing, Art, ArtWeek Boston, Autism, Birth of Flamenco, Boston, Boston Arts Consort, Brain, Cambridge MA, Celebrity Series, childcare, children, Childrens Dance, Childrens Flamenco, childrens yoga, Cultural Arts, dance, Dance in the Schools, dance teacher, early education, education, emotional development, empowerment, Equi-Yoga, executive functions, fitness, Flamenco, flamenco performance, flamenco teacher, Framingham, Framingham Public Schools, health, in-school yoga, inclusion, Instruction, kids, kids dance, kids flamenco, kids yoga, kinesthetic learning, Massachusetts, meditation, MetroWest, mindful, Mindfulness, Natick, Newton, Nourishing Teachers Strengthening Classrooms, Open Spirit, self esteem, sensory friendly, Sensory Processing, social skills, Special Needs, STEAM, stress, Sudbury, Teen Flamenco, teen yoga, teens, Tween Yoga, tweens, Wellesley, wellness, yoga, Yoga for Veterans, Yoga In The Park, Yoga in the schools, yoga teacher, Young Audiences of Massachusetts, youth, youth dance, youth flamenco, youth yoga | Permalink. Day Three: Dance In The Schools 2015 Eve’s STEAM Yoga…full steam ahead! Eve’s STEAM Yoga…full steam ahead! Spine Tingling Yooooogggggaaaaaaa-oooooooooooo! That’s as ghostly as it gets! Third day of bringing yoga to the Maria Baldwin and the Graham and Parks schools in Cambridge. I love the ability to tie my classes into the curriculum, even of not something they are learning directly but my bringing into my classes mindfulness, movement, breathing, meditation, anatomy, science, coding, art, math and fun and tying it to kinesthetic learning, I feel I am creating the ultimate STEAM-yoga class going that is fully inclusive-all ages, all abilities, Eve’s STEAM Yoga…full steam ahead! 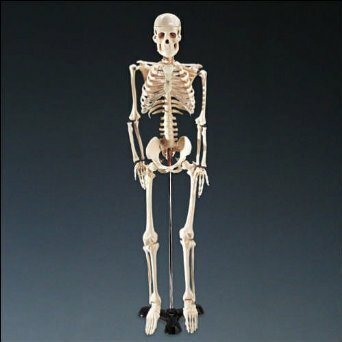 I brought my Mr. Thrifty skeleton to be able to point out the spine, sit bones, skull, hands, feet. I explained that Mr. Thrifty had never been a real person, that he was made of plastic, but he gives us an authentic version of the inside framework of the human body. Class started with me ringing the bell. I told everyone to take a moment to practice with their breath-sticks, a good way to settle everyone down. I led the first round of 5 count breathing and then one student did. Start by pointing out parts of Mr. Thrifty. Bones are the framework for your growing body. Need a strong frame (physically, emotionally, soulfully). 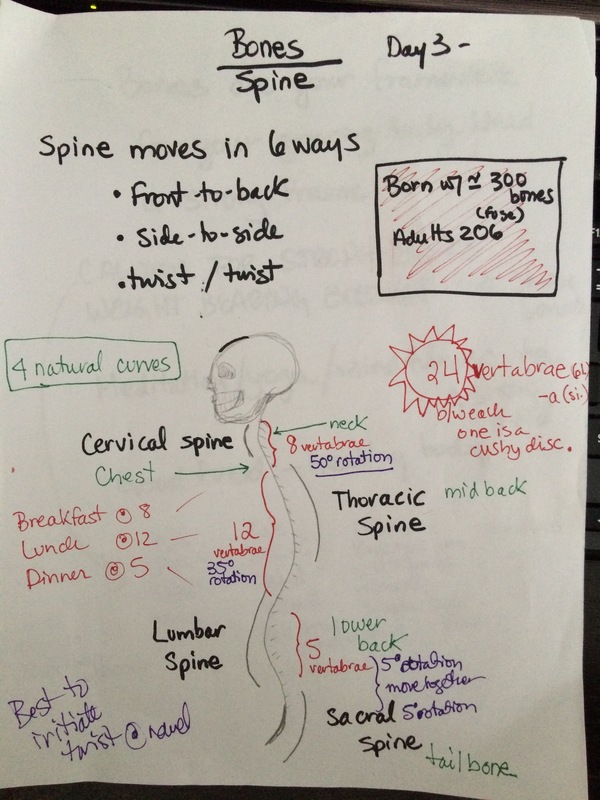 Spine: 24 vertebra (sing. )/vertebrae (pl.). Between each one is a soft, cushy disc. Cool Bone Facts: Choose to pepper your conversation with some of these cool facts. The spine can move in 6 ways: forward and back, leaning side-to-side and twisting right and left. You are born with 300 bones but some of them fuse over time and by adulthood, 206 bones. The arm is mostly commonly broken by adults, the collar bone by kids. Bones function as the skeleton for the human body, allows for body arts to move and protects organs from impact (just like we wear a helmet to protect our skull and a seat belt in a car.) Also, produce red & white blood cells. Forward and back = seated cat and cow; slow at first with a reminder to feel the spine moving; then fast to make the feeling more bright. Simple Twist-lift the right arm high, hold the left knee. Lift the left arm high and place it behind you, close to the body and near where your tail would be resting (an idea here is to have everyone wear a paper tail)Breath in and lift tall, then twisting from the navel area, breathing out and twisting towards your back hand. Gently. Breath in and then on the breath out release. 6 spinal movements from cw and cat: Hands and Knees-notice spine-cow and cat (forward and back movement); dog looking at tail (side-to-side movement); thread the needle (twisting movement). Table top to ½ scorpion to pointer dog (long and strong) to full scorpion (right arm/left leg)-feel your spine twisting, pointer dog (long and strong one more time)to ½ scorpion to table top. Repeat left arm/right leg. Rest in child’s pose. Feel your belly pressing against your legs when you breath in and then as you breath out, your body soften, like it is a piece of clothe laying across a rock. Feel your spine taking the shape supported by your legs. Feel like you can make you back rest in the inside of an eggshell. Downward facing Dog-spine feels long. Head is right between your arms and sit bones and pressing towards the crease where the wall and the ceiling meets behind you. Legs together. One leg up, wag it around. Bark like a dog. Switch legs. Then keeping both legs together behind you, doing uni-pod jumps-trying to kick yourself in the bottom. Bend knees. Look forward. Jump to your hands, Rise up…vertebra by vertebra, slowly slowly until all your vertebra have stacked up and you are standing tall. Breath out: Sit in your chair-reach your arms across the room, palms facing each other. …though lunges, standing split, plank-jump forward repeat full sequence on other side. Melting down to the floor. Hugs knees into chest, feel your spine. Rock side to side. Release legs. Feet towards ceiling but not candle pose as I do not like to do this pose with so many kids as I cannot be sure they will act safely towards their necks. Point and flex feet. Ankle circles inward then outward. Hug knees in. Rock and roll 3x to come to a seated position. Here we pratice what I call “Seated Tree (Janu Sirasana)” Start in Butterfly. Stretch right leg forward. Notice you are in tree pose here. Reach left arm high. Karate chop towards the pinky toe side of the foot or leg. 3x. Last one try to drape yourself over your leg. Fallen Tree. Repeat opposite side. Lie on back. Easy lying twist. Cervical Spine (neck) 8 vertebrae with 50 degrees rotation; thoracic spine (mid and upper back) 12vertabrae with 35 degrees of rotation; Lumbar spine (lower back) 5 vertebrae with 5 degrees of rotation, along with the Sacral spine which has the fused bones of the tail bone and move together with the lumbar spine with 5 degrees of rotation. A little rhyme to remember number of vertebrae in each area of spine: Breakfast at 8, lunch at 12 and dinner at 5. CALCIUM: Calcium for strong bones, exercise for strong bones, meditation/yoga/mindfulness for a strong mind. Good food for a healthy body. Proprioception: Knowing where your body is in space (difficult for kids with sensory processing disorder-expand) Refer to the game show “Hole In The Wall” or your ability to walk through a door frame without banging into the sides. 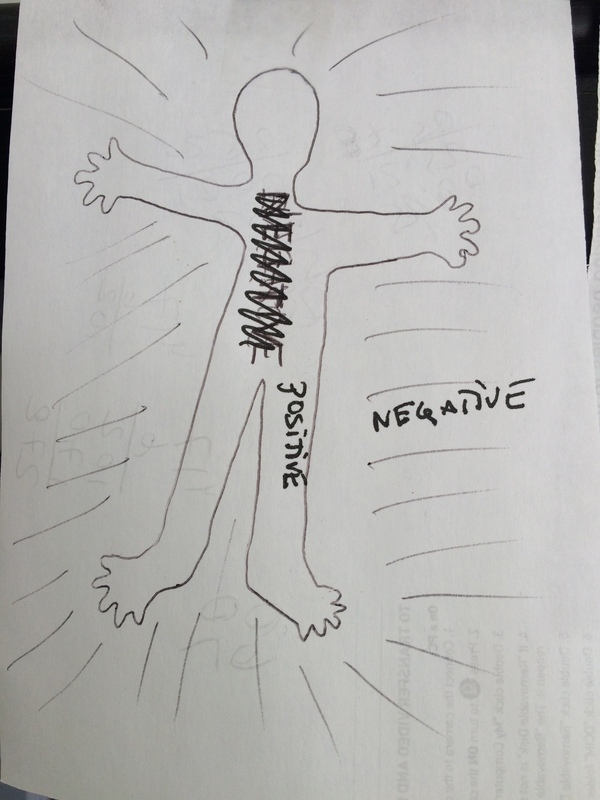 Think about the positive/negative space that your body creates in space. Have kids pass by each other without banging into each other. bones meet at joints; held in place at the joints by muscles and ligaments; cartilage covers the bones to protect against rubbing. restricted and a source of tension in the body. Dem Dry Bones: Yoga Style! Now, breath in and breath out! Now, big deep in, slowly breathe out! Feel the strength of your bones. As we slowly melt to the ground. Feel your relaxed, calm bones! Feel your calm, relaxed bones! Now, big breath in, long breath out! Now, deep breath in, long breath out! Ahhhhhhhhhhh! Categories: Always Be Dancing Mindful Movement | Tags: Dance in the Schools, yoga, Yoga in the schools, youth yoga | Permalink. The first of a four week stint of Yoga-Snacks for Dance Month in Cambridge has me combining the Cambridge Public Schools Common Core Science curriculum for the second grade level science with yoga. At the Maria Baldwin School, I started the unit off with viscosity. In the coming weeks, we will continue to explore the connection of yoga’s kinetic energy (i.e., energy of motion) with the amount of kinetic energy the molecules of a substance has which then determines whether the substance is a solid, liquid or gas. Looking at such scientific terms such as viscosity, melting point, freezing point, beading and surface tension, this yoga classes will enhance the science curriculum. Students will learn properties of water and other liquids, and recognize the importance of water to living and non-living things. They will also learn about the interaction of water with different materials, and apply that knowledge to practical problems such as liquid absorption and liquid containment all the while moving their bodies, building self confidence and sharing in a non-competitive, friendship building, calming group interaction. Day One: Viscosity: Today we started by examining the similarities and differences between water, vegetable oil and corn syrup. I brought in cups and small tubes and we poured these liquids through the tubes and discovered how quickly or slowly the liquids passed through the tubes. We used words like sticky, thick, goopy, fast, slow, clear and see through, when describing the viscosity of these three liquids. After our liquid experimenting, we talked about how the blood in our body keeps us alive and that the heart is a pump used to distribute the blood throughout the body. In that regards, less viscous blood and a strong healthy heart are the best things for us. We discussed how to keep our hearts healthy: eat good foods, don’t over eat or eat too little, no smoking, exercise, yoga, don’t eat too much junk food, drink water, be nice to each other…which was a great segue into our yoga section. Starting with “I Am Happy, I Am Good; Ha ha He he Ho ho Huuuu”– I noticed how everyone had smiles on their faces while doing this. We then practiced some vigorous poses and were then able to notice how are our hearts were beating faster at the end and we felt energized and happy. I then made up a short sequence and we first did it as slow as corn syrup, then a bit quicker like vegetable oil and then fast, like water through the pipes. Lying down, allowing our heart beats to slow down and bringing focus back to our breathing, we did deep relaxation with a right side/left side breath-centric focus and the noodle test (see Shakata Kaur Khalsa’s “Fly Like A Butterfly: Yoga for Children) and then Savasana. Day Two: Beading, Surface Tension, Absorption: Today, I brought in molasses, vegetable oil and water to help the children understand the concept of beading and surface friction. We started with a short review of viscosity and then naturally that lead us to the idea of how liquids bead on different surfaces and then also a bit about absorption. Ms. Power’s 2nd grade classroom has an awesome tool- a surface camera, so I was able to work on the counter surface and the images were projected onto the screen set up ion the room. That way, the kids did not have to crowd around the counter to see. We started by pouring water, oil and molasses onto the counter surface to see what would happen-if the liquid would stay together, spread or bead. We then tried the same experiment on wax paper and then finally on paper towel. Yoga class started with a variation of the “Sa-Ta-Na-Ma Meditation”…instead of saying Sa-Ta-Na-Ma, we said, “Water”: Thumb to Pinky finger, “Oil”: Thumb to Ring finger, “Mola-” Thumb to Middle finger (sounds like the “a” in “back”), “-Sses” (sounds likes “says”): Thumb to Pointer. The rest of class focused on poses that started small and spread wide (Child’s Pose (Molasses Pose) spread to Table Top (Oil Pose) which spread to Downward Facing Dog (Water Pose); Vishnu’s Couch added Tree Pose leg which added Hand to Big Toe Stretch; Mountain grew to Up Mountain which grew to Star Pose) and then also poses that started as a single “blob” but were drawn to join other “blob poses” near them, so single poses became team poses. Class ended with a deep relaxation that took their energy from a water state to an oil state to a slowed down oozing molasses state. Let them wiggle to flow to settle. Day Three: Freezing Point & Melting Point: Moving from liquid to solid to liquid: I was inspired to do some liquid freezing tests by the questions that were posed by the students on a work sheet that was distributed: 1. What do you know about liquids? 2. What do you want to know about liquids? 3. What did you learn about liquids? In the second section, many of the kids were asking if corn syrup/molasses would freeze? And what about oil? I decided to conduct an experiment basing all freezing points against that of water to see what would happen to molasses and oil in the freezer? I made up three containers, one with water, one with oil and one with molasses and I placed them in the freezer. Every 1/2 hour (up till 2 hours and then once again over night), I would go and check on the liquids to see what state of freezing they were in. The water froze in 2 hours, the oil never froze but got cloudy and the molasses never froze either, but became so vicious that it could not pour. After leaving the liquids over night, the oil became hard like a cake of butter and the molasses was like tar, but after 1/2 hour of being out of the freezer, all liquids had returned to their original liquid state. The yoga portion of the class had us first sequencing poses that flow: * I made up some rhymes to go along with the flows. 1. I am water (Mountain Pose) 2. The weather is fair (Up Mountain-hands above head, palms touching, like an umbrella) 3. Watch me turn into the air (Jump out to Star Pose-taking up space and “air”). 1. I am water (Warrior I) 2. I am free (Warrior II) 3. Watch me flow into the sea (Warrior III) 1. I am water (Downward Facing Dog Pose) 2. It’s so nice (Hands and Knees Table Top Pose) 3. Watch me turn into some ice (Child’s Pose). * Freeze Yoga Dance: I played the Song “Happy” by Pharrell, which I know is an anthem at this time and it has a nice message and appropriate lyrics. First we went through the poses that we knew…so at each music stop, I would call out “Freeze into “one of the poses” and all the kids took the same one together, then for the last few times, it was a free for all and at the music stops, they could take any pose they wanted to. My final experiments checked out the “freezability” of water and oil, water and molasses and finally water , oil and molasses. These were the final three question from the students. Will they freeze if combined? Well the results are in…when combined, the liquids separate and then freeze and coagulate in layers. This final session will not be a science tie-in, instead it will be a class of yoga combined with dance, flamenco, a mixing that I call ¡Ole Namaste! which is on the cutting edge of the global yoga and dance trend infusing the movements, breath-work and meditation of yoga with the music and dance of flamenco. The students had a body stretching, breath enhancing, mind relaxing, hand clapping good time! In this fun, upbeat yoga class, that is infused with the music and dance of flamenco, students absorbed the dramatic postures and colorful flavor of flamenco while exploring yoga poses, philosophy, breath work and meditation. My take away from this enriching experience is how important kinesthetic, or body-based, teaching methods can be in reaching students , particularly those with special needs. For all students K-12, body-based teaching is a way to reproduce curricular content and is a widely accessible step to cultivate critical thinking skills. Not only that, kinesthetic based teaching is fun to incorporate into the classroom, offering a connection to social and emotional intelligence standards as well. Kinesthetic methods have the power to inspire both individual and whole-class attention and energy levels and mental states and can assist in memory retention. By incorporating yoga into the 2nd grade science curriculum, I was able to focus, unify, and both calm down and energize students and to reach those for whom kinesthetic intelligence is a strength. This was a fun experience and enriching for myself, the teachers, Megan Powers and Karma Paoletti, the students and the whole Baldwin community. Three cheers to the Maria Baldwin School in Cambridge, MA! Big shout out to Nicholas Leonardos, Principal, for his dedication to his school! And to Erica Sigal, Coordinator of Dance in the Schools. Categories: Adamant Eve, children, Childrens Flamenco, childrens yoga, classroom yoga, Dance In The Schools, Eve Costarelli, healthy, in school yoga, kids yoga, Young Audiences of Massachusetts, youth, youth yoga | Tags: Cambridge MA, Dance in the Schools, Flamenco, kinesthetic learning, Ole Namaste, yoga, youth flamenco, youth yoga | Permalink.